Roti, chapati or as we call in our house phulka(literally meaning which has been inflated), is the basic Indian bread and is a staple food of North India, though it's also been eaten in other parts of India but in northern India it's basically part of every meal. Roti is generally defined as Indian flat bread made with whole wheat flour(atta). No rising agents are used for the dough as roti is unleavened flat bread. Unlike bread, roti is usually eaten fresh, when I say fresh that means dough can be prepare in advance kept in the fridge & at the time of lunch/dinner roti is rolled & cooked. But if you have any leftovers of roti they really taste good with acchar(pickle) or chutney or just put some cooked dry veggie on it & roll it like burrito.....nothing can match that taste. When one of the fellow blogger asked me if I'm gonna do post on roti, I thought that's simple, but wait a minute, it's simplicity itself is main difficulty here....it's so simple & basic that we never measure the flour or water portions for this, everything is eyeballed. Whenever I finish with one batch of dough I knead next batch, no matter what, roti dough is always there in the fridge. Roti can be eaten with cooked dry vegetables called subzi, lentils or with gravies vegetarian as well as non-vegetarian & also with seafood. Here's the recipe for roti/chapati/phulka, I tried my best but I think for a person who's never seen roti specially the process of making it, first time it might be little difficult. x'tra wheat flour(around 1/2 cup or so) needed for rolling the roti. Tawa(flat griddle), preferably cast iron or non-stick pan will also do. 1) Take 1 & half cup of flour, salt(if using) add little water, using your hand mix them, add little bit more water & mix it again. Never put all the water in one time, always put little at a time, when all the flour comes together, just wet your hand when needed & make one big ball of the flour. 2) Now knead it for around 2 min. or so using the back side of your fist. It'll be little sticky in the beginning. Now just cover it with either a damp cloth or with some bowl. 3) Let it rest for roughly 10 min. After resting time knead the dough for 2-3 minutes, this time it will be very smooth. Once done take 2-3 drops of oil on your hand & roll the dough ball in it. Keep it in a bowl with tight lid on it in the fridge. 4) Take the dough out of the fridge at least 10 min. prior to making roti. Note : Roti dough is not very loose or tight dough, it's soft dough. In case if u find it's difficult to handle you can always add little more water or dry flour to get the right consistency. 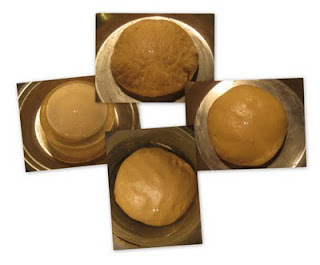 Every time you make the dough water quantity may vary little bit, due to temperature, different flour brands etc.. This dough can be kept in the fridge for upto 2 days or even more but it's best to use within 2 days. To make soft rotis(specially for the kids) instead of water milk can be used, but then dough should be used within a day or so. Another option is to use around 1 tblsp. of cooking oil alongwith water. 1) Heat griddle/pan on med. high. 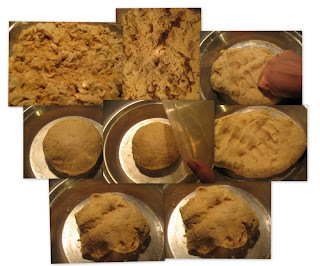 Put x'tra flour in some flat plate or bowl, big enough to hold the rolled roti(approximately 6-8" in diameter). 2) Take a little dough(little bigger then ping pong ball) roll it in your hand like a ball. Now roll it into x'tra dry flour, gently shake it to get rid of x'tra flour. 4) Take the rolled roti turn it 90 degree & again roll it till u get around 7" or so, whenever you feel it's getting sticky gently pick it up put it on the flour plate & again back to rolling surface & roll it. 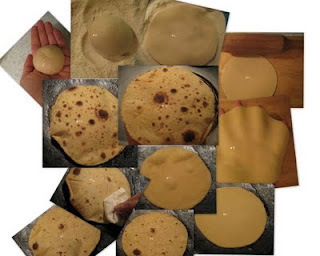 It's not that difficult as it sounds and don't worry if in the beginning you can't get exact round....I have made few, actually lots of international maps when I started to make rotis. Only a little bit of practice & lots of patience. 5) To check if griddle is hot or not, keep your hands 2" away(on top side) from the pan/griddle, if it's hot enough you can feel it, you won't be able to keep your hand there for long time. 6) Now put the rolled roti on it, after around 35-40 seconds turn it upside down. Again after 35-40 sec. turn it back, this time you will see from some spots it's puffing up. Using kitchen towel u can gently press at the spots it's not puffing & soon it will start to puff up, now again turn it upside down for 7-8 seconds, if you are not comfortable using kitchen towel as hot air sometime directly blow on your hands, it's better to use spatula. Take it off the pan. 7) Apply ghee/butter. Eat fresh with Subji(cooked veggies), dal(lentils) or your favourite non-veg dish. Note: If you want to make them ahead of time in that case line a heavy duty foil with a kitchen towel & keep your rotis inside that. You can also directly puff the roti's on the direct flame, but might be little tricky for the beginners. To make it totally fat free and vegan ghee can be left out. Your explanations are very clear and thank you so much. I can't wait to try it! Do you have any idea what to do with a rusted cast-iron skillet? Hi Joumana, for rust on cast iron, what I do is first wash with warm water then towel dry it & put it on little heat so that it get little warm apply 5-6 drops(or more if needed) of cooking oil & rub it overall using some old cloth, it usually works for my old iron karahi(wok. Do let me know whenever u try roti, all the best. SE,you r so right sometimes simple things are tough to follow. Mmmmmm, homemade roti's are the best! Thank you so much for leading me back to your blog. I am definately going to try using a little milk or oil the next time I make my chapatis. I think it will really make a difference!